breadfruit fritters at Yvonne's, Hatiheu, Nuku Hiva, French Polynesia. "It's the best grilled fish I've ever eaten!" gushed some fellow Nuku Hiva travelers. 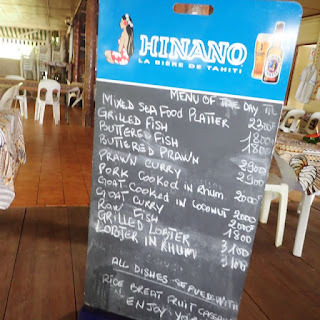 They were referring to Yvonne's, in Hatiheu, reputedly the best spot to eat on Nuku Hiva, Marquesas, the largest island of the bunch. Fellow cruisers on MaryAnn tried to talk us into sailing around the island (to adjacent and legendary but upwind Anaho Bay) to join them for a special order luau-style meal there; we opted out. 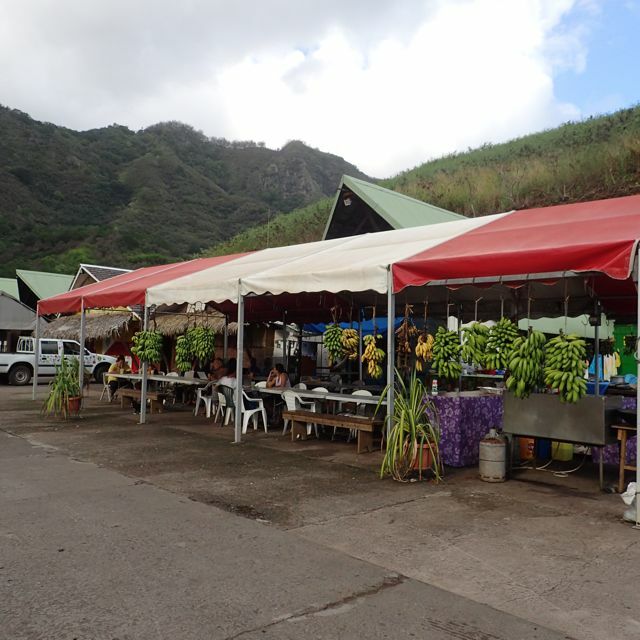 The $65/day + buy-your-own-meal guided island tour, stopped at Yvonne's, too. 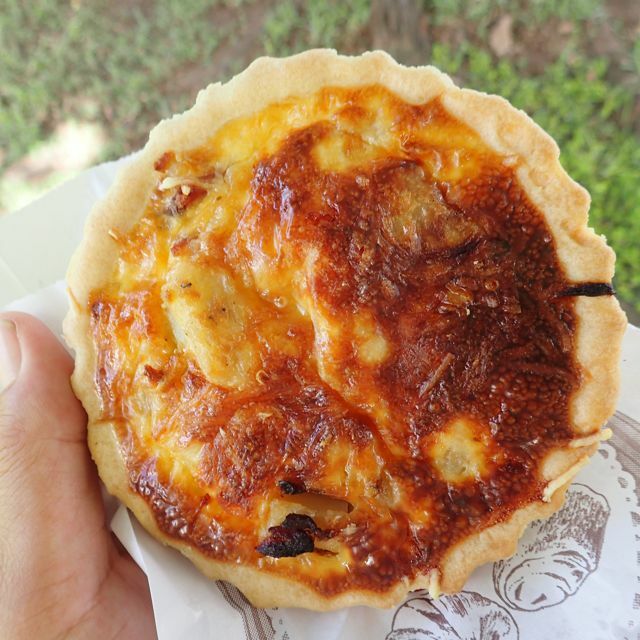 Nuku Hiva, purveyor of quiche. Thus, my expectations of Yvonne's were high. Quiche, a bargain bite for $2.50. 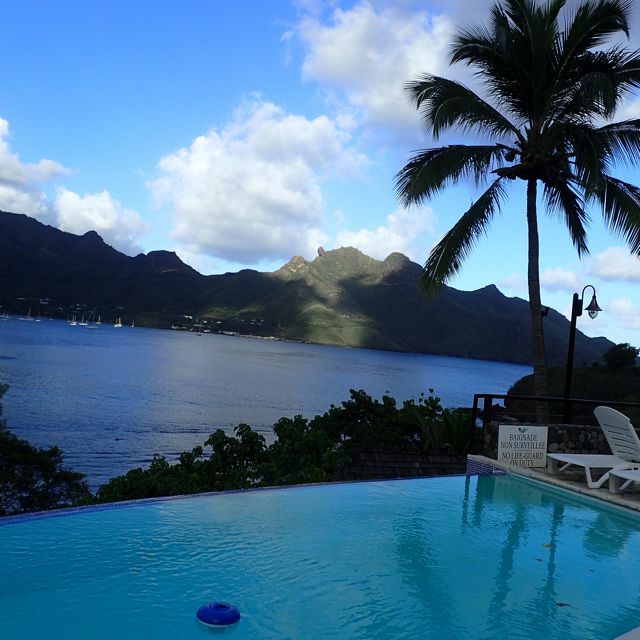 Pearl Lodge, overlooking Nuku Hiva's Tahioe Bay. Marquesas. When someone asks me about what I consider "the best," I try to stop myself, and ask, "What do you like?" Wine Spectator, Yelp, Trip Advisor, etc., everyone has their biases, including me. All too often I forget to challenge others who opine about their best with the same question. 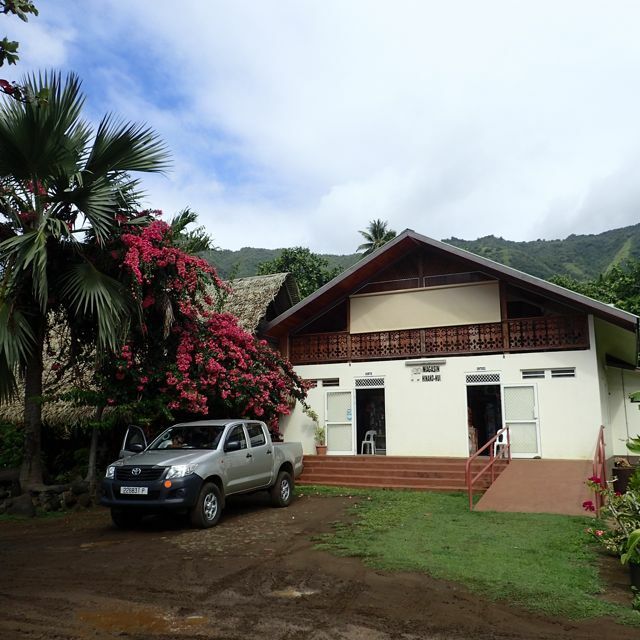 to the right of Nuku Hiva Yacht Services. My bias is for mouthwatering flavor, be it explode-in-your-mouth intense, or superbly sublime. I rarely like greasy or bland. While willing to open my (or Wayne's) wallet, I'm frugal and in all immodesty, a good enough cook, it feels like a ripoff if I make it better myself. I love flowers, lovely views and decor and fancy settings, but if the food costs more than $10 USD for an entree, if it's not delicious, I'm unimpressed with the bling. Thus. my top picks lean more heavily toward road food rather than restaurants. If you disagree with what makes an eatery worthy, that's ok. At least you know my biases and can factor them against my recommendations accordingly. 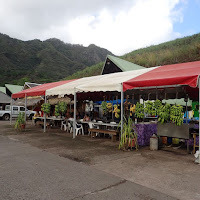 When we first arrived, I made a beeline for the stand to the right of Nuku Hiva Yacht Services, where cruisiers huddled at the long benches soaking up the wifi and power extensions. It was mid-afternoon, and I was making plans for dinner 'out' there. "What time do you close?" I asked in French. "We're open now," the woman at the counter replied, a bit haughtily, in English. I repeated my question. She repeated her answer. Frustrated, I determined it was not a language issue, but an attitude issue, shrugged my shoulders and left, figuring I'd just return around dinnertime. 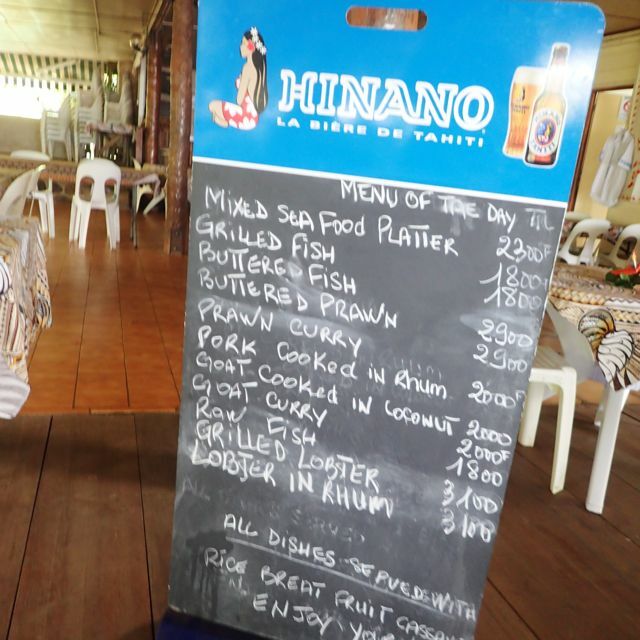 Menu at Yvonne's, Hatiheu Nuku Hiva Marquesas -- the English side. rate is a bit better than that these days. Around dinner time, I was told, "We're closed." "What time do you close? ", I enquired (again). "Six," was the reply. It was 5:15 when I returned to the boat. Wayne did later buy a cup of coffee there, and I bought some breaded tuna. They were ok. 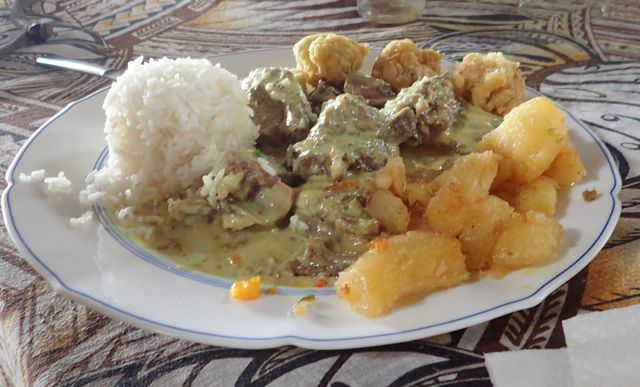 The next day, I ate at the food stand on the other side of Nuku Hiva Yacht Services. No free wifi or plug-ins, but it seemed to be a mostly locals' hangout, with the occasional French cruiser or three. They were friendly, with a similar menu and similar prices, $10 for most entrees. 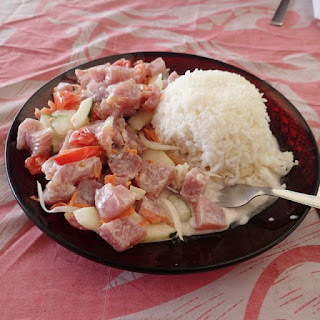 I ordered the poisson cru (tuna ceviche), their choice whether coco au lait (with coconut milk) or Chinois (Chinese style). 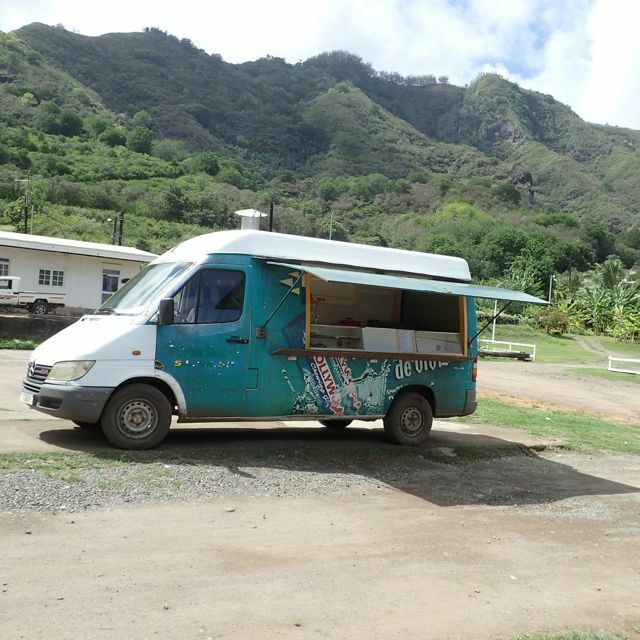 They brought it au lait, fast, and like the food truck on Hiva Oa, on plates, with silverware. 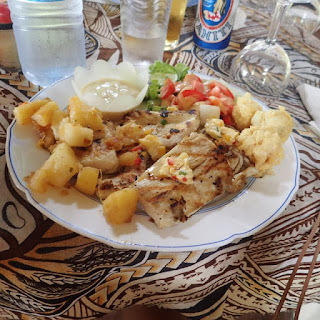 It was good, though honors for the tastiest poisson cru au lait still goes to the $18 plate Relais Moehau on Hiva Oa (not the boys on Tahuata's Hanamoenoa beach). Hatiheu Nuku Hiva, Marquesas, French Polynesia. 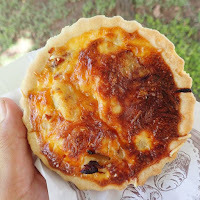 The $2.50 bacon, potato and onion quiche from lunchtime food truck parked in the parking lot the Nuku Hiva community performance hall was pretty good too. We took in the view for $6/beer (Hinano), $7/house wine (awful), $8.50 for a gin-and-tonic at the upscale Pearl Lodge. Considering gin sells for around $50/bottle and up, the mixed drinks price seemed reasonable. We didn't order food, though the travelers who gushed over Yvonne's were staying at this posh place. With the going tour-the-island guide price at $65/head versus $120 + diesel for a rental "car" for four, and mostly paved roads, we opted for the the 4-wheel-drive extended cab Toyota truck. 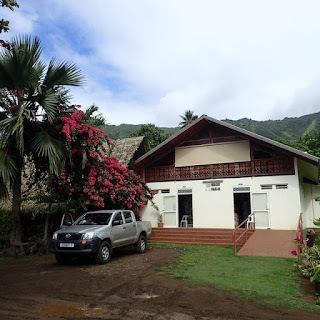 Watch for a future post on our scenic Nuku Hiva road trip. We figured we could play by ear whether or not to spend our "savings" on the guide on a meal at Yvonne's. We weren't sure we were at the right place when we stopped in little Hatiheu, a pretty town on the bay, framed by toothy dramatic spires on one side. There was a sign for a grocery store, and a restaurant was attached, but we didn't see the sign for the restaurant. "Is this Yvonne's?" I asked the attractive older woman behind the counter. "I'm Yvonne," she replied, with a gentle smile. We were the only customers in Yvonne's large restaurant, which looked like it could easily accommodate 100. Beautiful hibiscus arrangements graced every table. Service was prompt and pleasant. We already knew the prices were $18+/ entree, and generous, including a side of cassava and breadfruit. 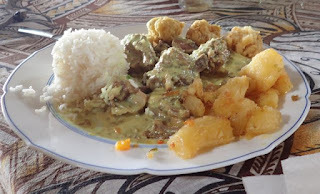 breadfruit fritters, cassava, curried goat (center), and white rice. I ordered the grilled fish, on recommendation from the Pearl Lodge guests. Wayne ordered the curried goat, as he knew I wanted to try it, and we planned to share. The food was good, but didn't "wow" me. I've eaten better curried goat and a good grilled fish is enjoyable but rarely rocks my world. I appreciated that it was all local fare. 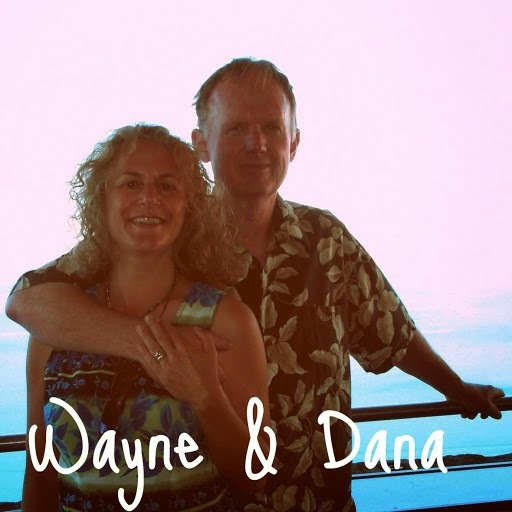 Wayne groused about what it cost to prepare (almost nothing) versus what we paid. My take-away? If $18-$30/generous plate for some decent local grub with good service in a beautiful local setting is perfectly ok with you, you'll enjoy your meal at Yvonne's. 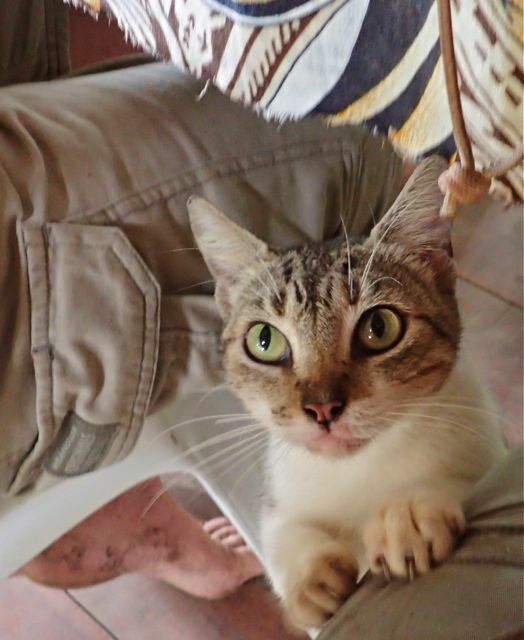 The assertive hand-out hungry kitty at Yvonne's will likely stick in my memory than the pleasant but nothing-that-special-in-my-book meal. 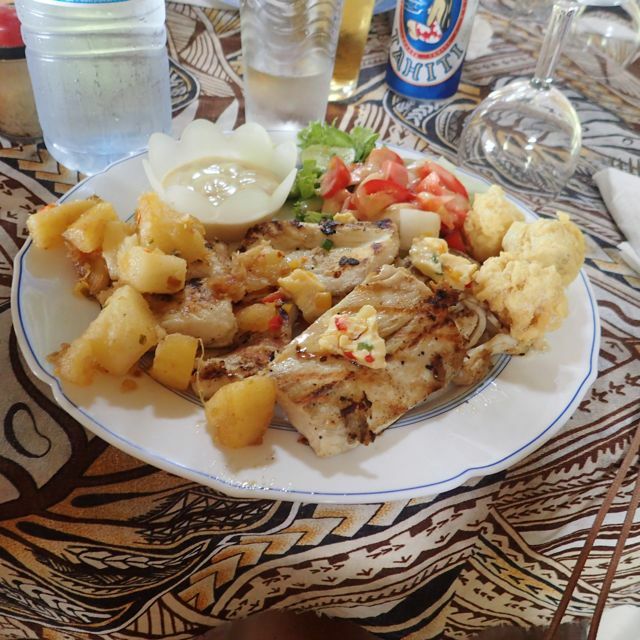 I'm glad our trip was far more about exploring the island of Nuku Hiva than the food, or I would've felt a bit disappointed. 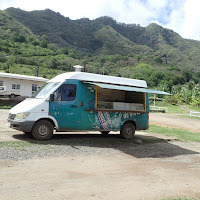 Then again, the bar is pretty high for me, but Nuku Hiva's road food remains solidly in the lead on my top "best eats" picks for Nuku Hiva. 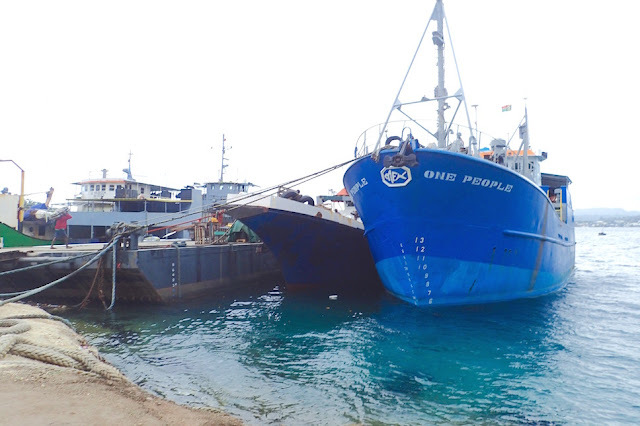 like the sibling kitties we saw on Ua Poa. We are currently on our fifth and final Marquesas island stop, Nuku Hiva's Tahioe Bay (S8.54.856 W140.05.880), before moving onto the Tuamotus, which are still part of French Polynesia.